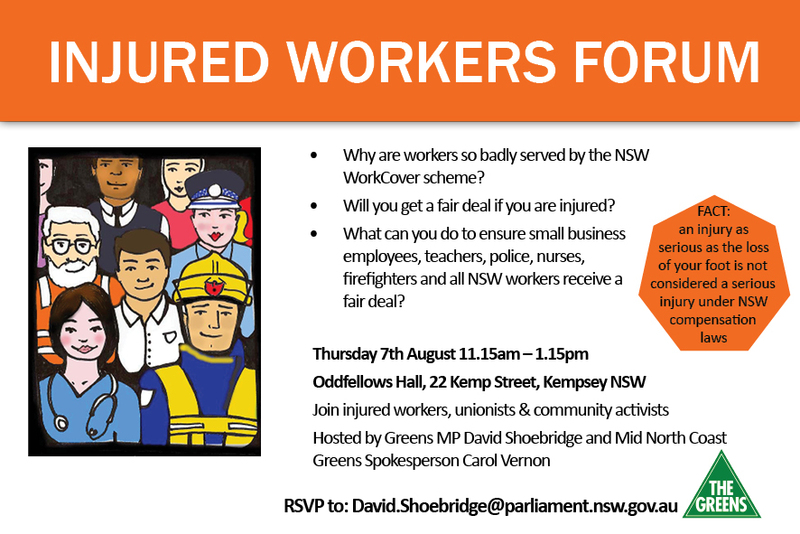 Next week David will be making a trip to the Mid-North Coast to host a forum and meet with injured workers who as a result of the Government’s savage workers compensation cuts have been treated unfairly and lost some or all of their benefits. WHEN: 7th August 2014, 11.15AM – 1.15PM. WHERE: Oddfellows Hall, 22 Kemp St, Kempsey, NSW. WHO: Injured workers, unionists and community activists. Last month the Minister for Finance and Services Dominic Perrottet announced minor changes to the Workers Compensation Scheme that will take place from 1 September 2014 and offer some reprieve some workers who were injured prior to 1 October 2012. The forum will be an important opportunity to better understand the changes to the workers compensation scheme, meet with people who may have been similarly affected and rally together for justice.